I haven’t used Zecco for a long time, especially after they introduced the new pricing structure , which requires $25,000 account minimum or 25 trades every month in order to get 10 commission free trades per month, early this year. 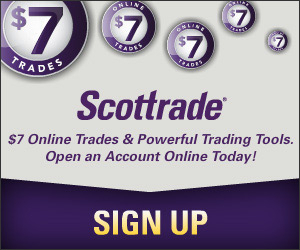 All my recent trades were done with Scottrade, using free trades I neared from the broker. I have no idea how the pricing change at Zecco has affected its customers (I heard quite some investors threatened to leave once the new policy is in place, which was in effect last month) , but it seems that Zecco has taken some steps to attract new customers with a few new products it introduced recently. I’d like to learn how to trade forex. But until I become confident in currency trading, I am not going to touch it. Another service is Zecco Alert, which I think is more useful to investors. I signed up with Zecco Alert and I have been getting daily updates delivered to my email on the market (most active stocks, bullish & bearish ideas, and analyst calls) as well as on individual stocks (mostly price changes). 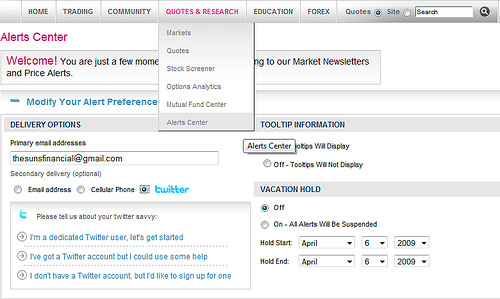 If you prefer, you can also choose to receive alerts via Twitter (follow me on Twitter @SunFinancial) instead of email. While these changes are nice, I’d rather like to see Zecco focus more on its core business: online discount brokerage, because that’s what it is known. There are a lot of areas it can do, such as customer service and the usability of its website, two areas that people mostly complain about, to give its customers a better experience. A new forex trading platform won’t do much to improve its image I am afraid. I’d rather them spend more time and effort to improve their existing services. Currency trading is always a big business. But one has to understand it first before jumping in. Since I know nothing about it, I stay away from it.